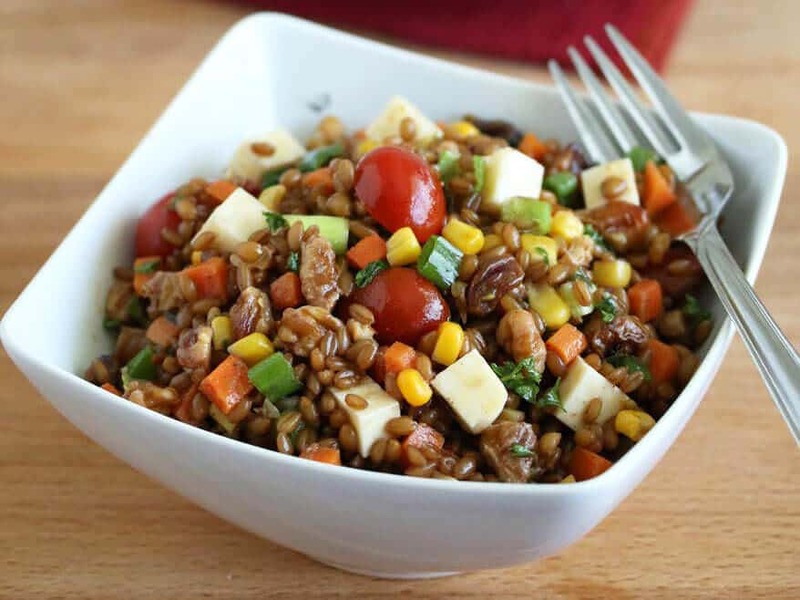 A deliciously flavorful, vibrant and healthy whole grain salad laced with smoky chipotles, tangy cheese, and a sweet & savory vinaigrette! PLUS, a cookbook giveaway! This salad packs in several fiber- and vitamin-rich vegetables, iron-rich raisins, protein-rich walnuts, and olive oil which is packed full of healthy omega fats. And then there are the wheat berries with all their high fiber/high protein goodness. 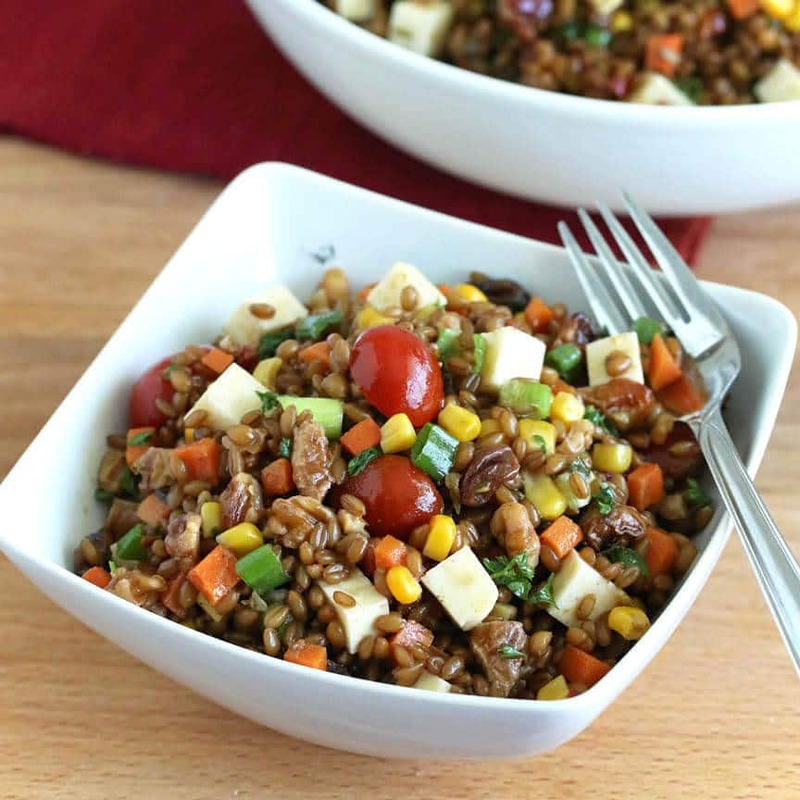 Perhaps you can relate – in my experience, too often healthy grain salads just lack flavor. Too often they’re just plain…plain. Boring. And it doesn’t have to be that way. Healthy doesn’t have to be bland and flavorless. 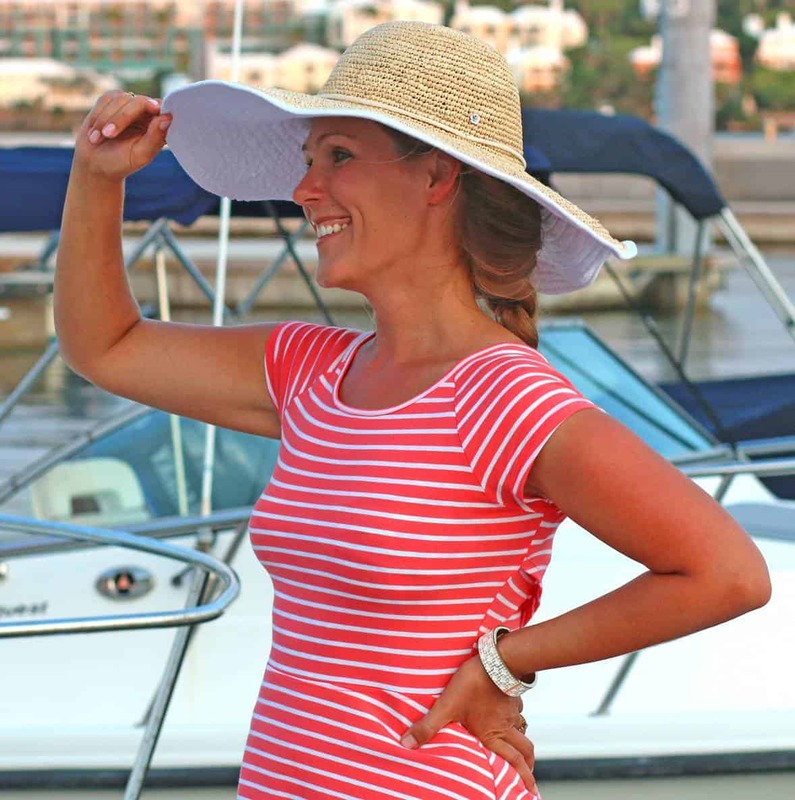 It can be bold and adventurous. And that’s just what this salad offers. It’s BIG on healthy ingredients and it’s BIG on flavor! Sweet, spicy, tangy, and smoky combine to give this salad enough layers of flavor to keep your taste buds entertained the whole dish through. Enjoy this salad as a side or a light entree. And it’s perfect for taking to work for lunch! Don’t like wheat berries? Substitute any whole grain of your choice. For example, quinoa. 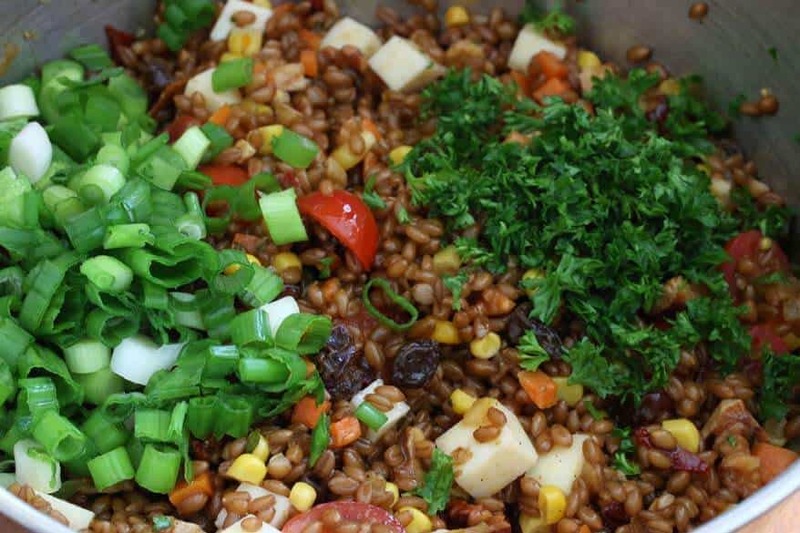 If you like barley or brown rice, try that instead. And though it’s not a grain, another great alternative would be couscous. The idea for this salad was inspired by Aida Mollenkamp’s recipe on California Walnuts’ website. I’ve changed things up quite a bit to suit my own taste, adding several more ingredients for variety, flavor, color and texture and have ramped up the flavor. And now for the Cookbook Giveaway! 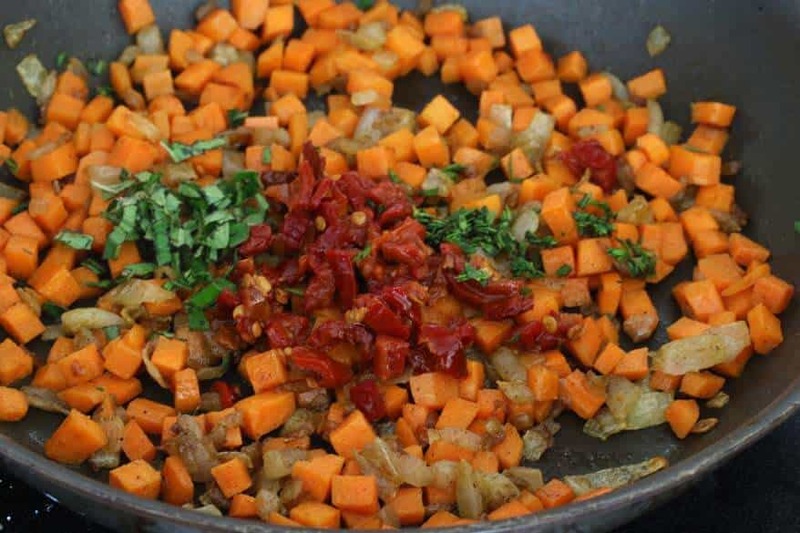 Are you a fan of whole foods-based recipes? For those of you who don’t know, Aida has released her first cookbook, “Keys To The Kitchen“, and now is your opportunity to win a copy of it! And now, let’s get to that fabulous Mexican Wheat Berry Salad with Chipotles and Toasted Walnuts! 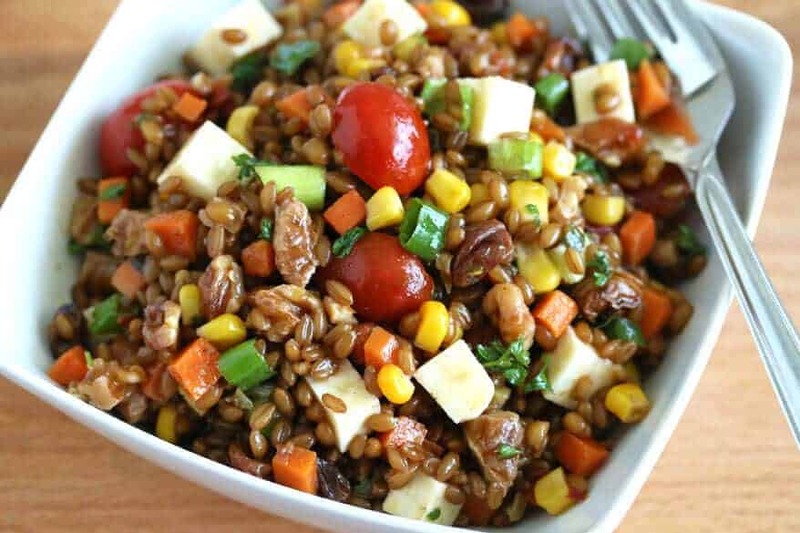 Use soft wheat berries (as opposed to hard wheat berries) for this salad. You can find them in most health food stores or BUY ONLINE HERE. Rinse the wheat berries. 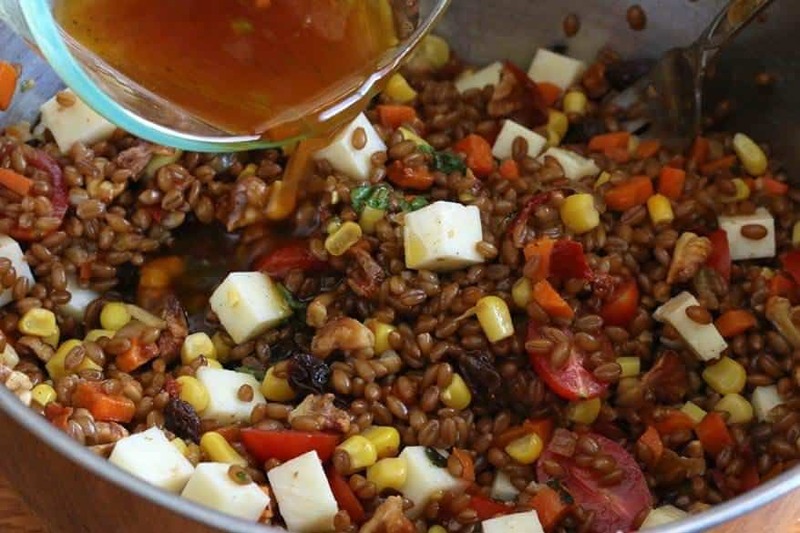 Bring the vegetable stock and salt to a boil, add the wheat berries, reduce the heat to medium-low and simmer for 30-40 minutes until soft but still chewy. Drain and let cool. Prepare all the ingredients so they’re ready to combine when the time comes. 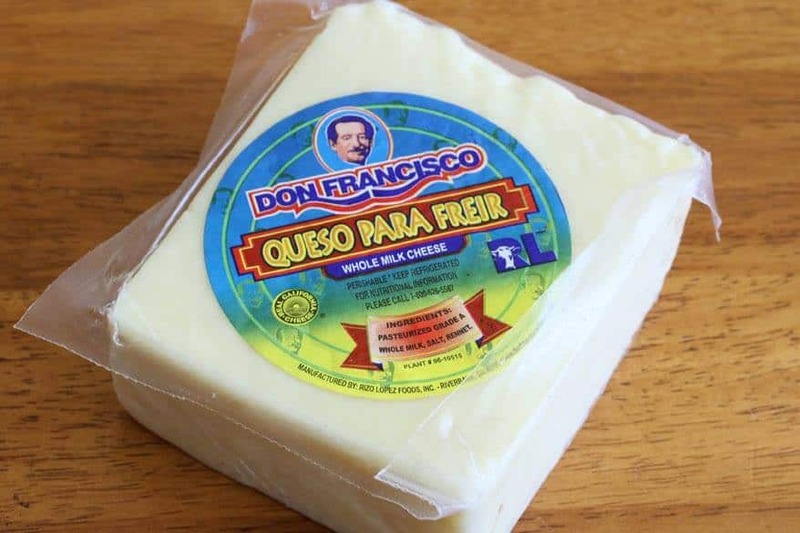 For the cheese, I used queso para freir, a firm and tangy Mexican whole milk cheese (found in Latino grocery stores), but you can use monterey jack instead. Heat the olive oil in a small skillet saucepan over medium-high heat and cook the onions until golden brown. Add the cumin and cook for another minute. Add the carrots and salt and cook for 3-4 minutes until softened. Add the fresh thyme, oregano and chopped chipotles and cook for another 2 minutes. Let cool. 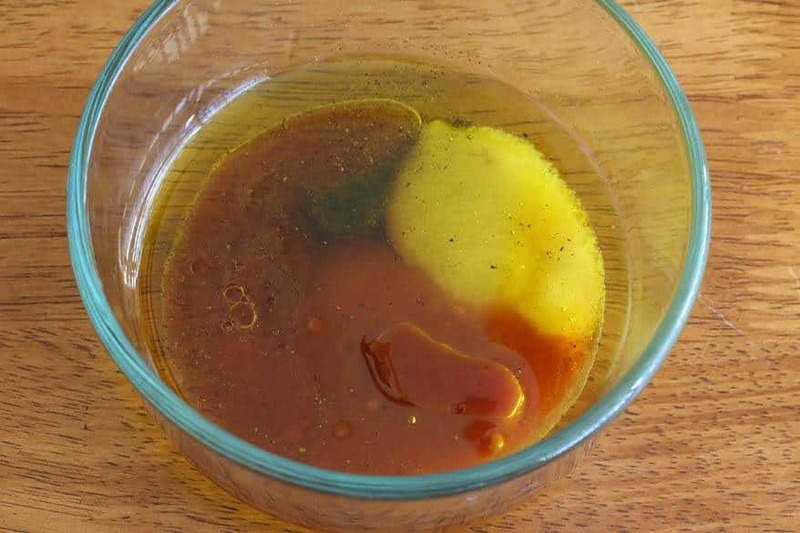 To make the vinaigrette, combine all ingredients in a small bowl and whisk until emulsified. 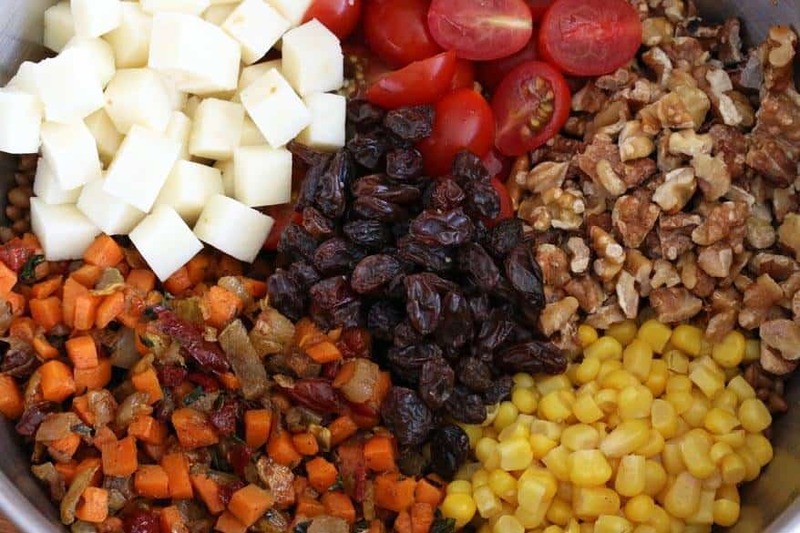 In a large mixing bowl, combine the wheat berries, carrot mixture, cheese, cherry tomatoes, raisins, toasted walnuts and corn. Stir to combine. Pour the vinaigrette over the mixture and stir to thoroughly combine. Stir in the green onions and fresh cilantro or parsley. Let sit for at least 30 minutes before serving. Best served at room temperature. Refrigerate leftovers. Rinse the wheat berries. 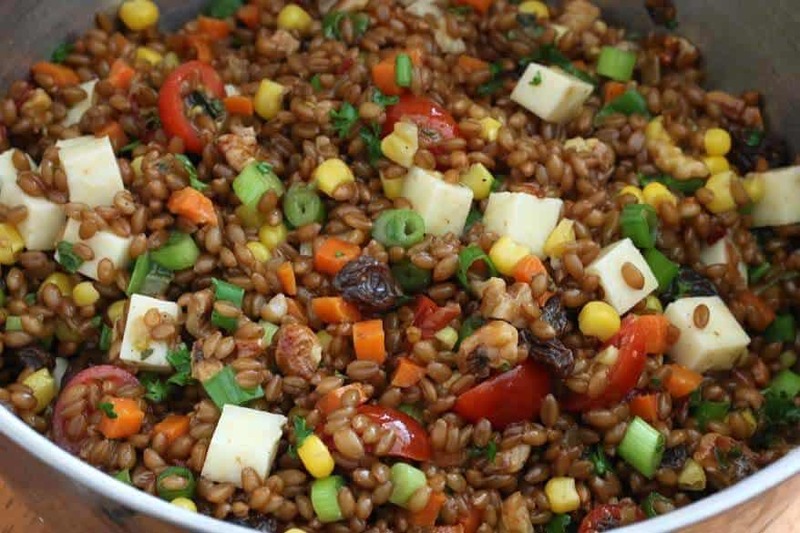 Bring the vegetable stock with salt to a boil and add the wheat berries. Reduce the heat to medium-low and simmer for 30-40 minutes until soft but still chewy. Drain and allow to cool. 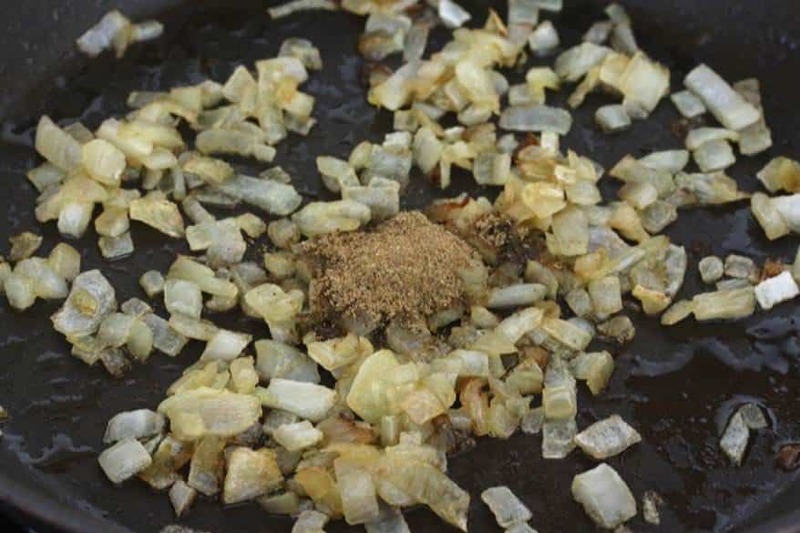 Heat the olive oil in a small skillet over medium-high heat and saute the onions and until golden brown, 7-8 minutes. Add the cumin and cook for another minute. 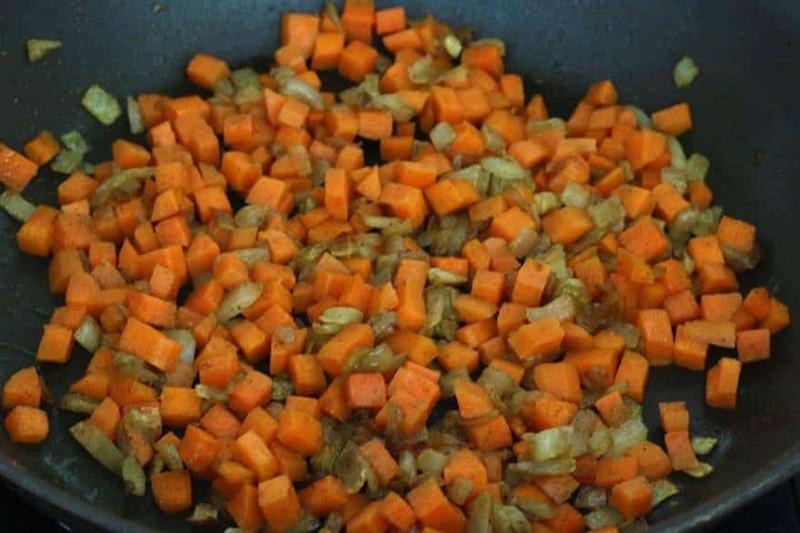 Add the carrots and salt and cook for 3-4 minutes until softened. Add the thyme, oregano, and chopped chipotles and cook for another 2 minutes. Let cool. To make the vinaigrette: Combine all ingredients in a small bowl and whisk until emulsified. 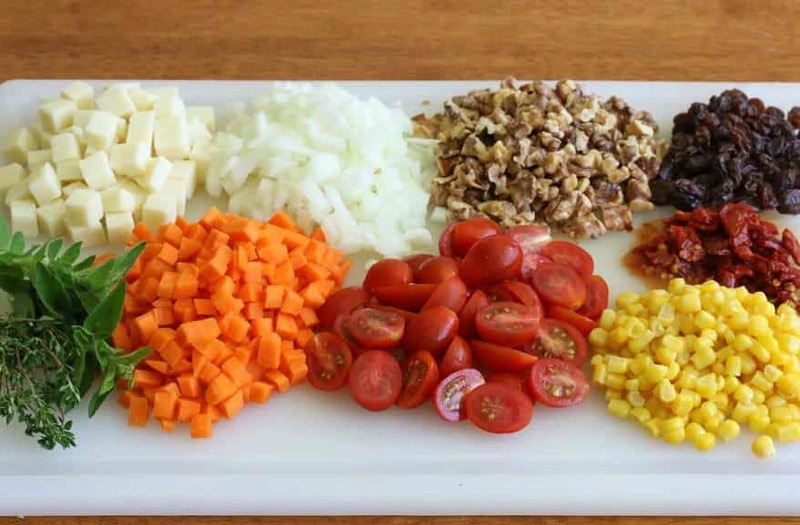 In a large mixing bowl, combine the onion/carrot mixture with the wheat berries and all remaining ingredients. Pour over the vinaigrette and stir to thoroughly combine. Let the salad sit for at least 30 minutes before serving. Best served at room temperature. Store leftovers in the refrigerator. 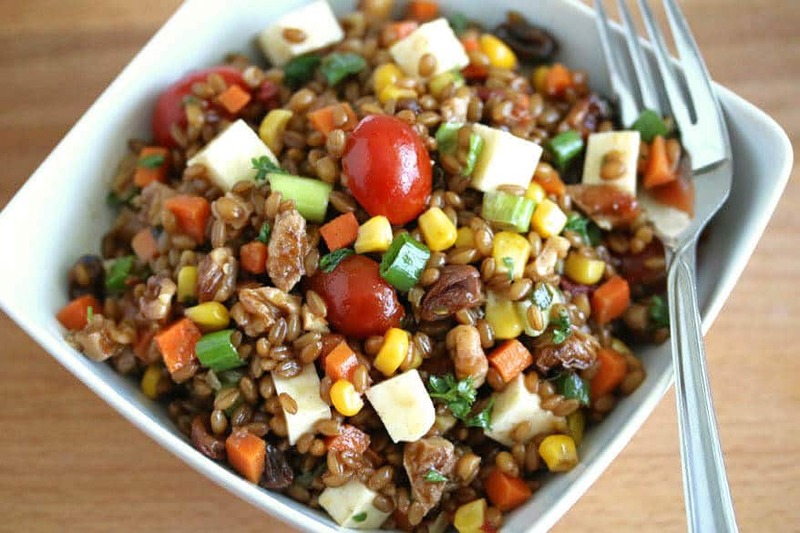 This salad would also work well with quinoa, barley, brown rice, or practically any whole grain of your choice. Though it's not a grain, another great alternative is couscous. Can’t wait to try this recipe! If this is an example of the recipes in the book, well, then, Pick Me, Pick Me!!! Yes the cookbook would be a lovely prize to win, but I also had a question! With the absence of wheat berries (though they look awesome) what would be some top choice substitutes? Hi Annastacia! You can substitute practically any whole grain of your choice. A couple of good options would be quinoa or barley. Though it’s not a grain, this salad would also be great with couscous. I’m not the greatest cook, so the How-To portion of the book would be a great help. I love cookbooks that explain things well. I would love to have a copy of this cookbook because I am very interested in healthy, whole food recipes. Your salad sounds like a real winner. I love cooking and am always looking for to stretch myself and try new things. This cookbook would be the perfect thing to help me along my culinary journey! I would like this book because i currently rotate between about 10 recipes, and rarely branch out to try something new with ingredients i wouldnt think to use! I am such a big fan of hers; what a thrill it would be to have this book. My wife and I just “whipped” this up and the results were great. Although me (aka the scullery maid) cleaning up the kitchen is going to be labor intensive, it will be worth it. Now off to the store for a bottle of vino. I’ve been thinking I need to try more new recipes and I think this book can help me do it. I want to win this cookbook, because the recipes look impossibly delicious. I also collect (and use!) Cookbooks. 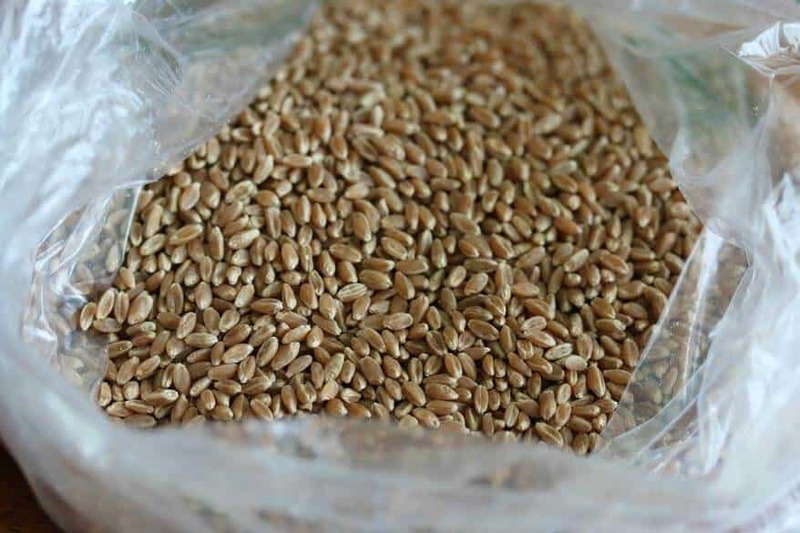 Can one substitute sprouted wheat for the cooked wheat berries? 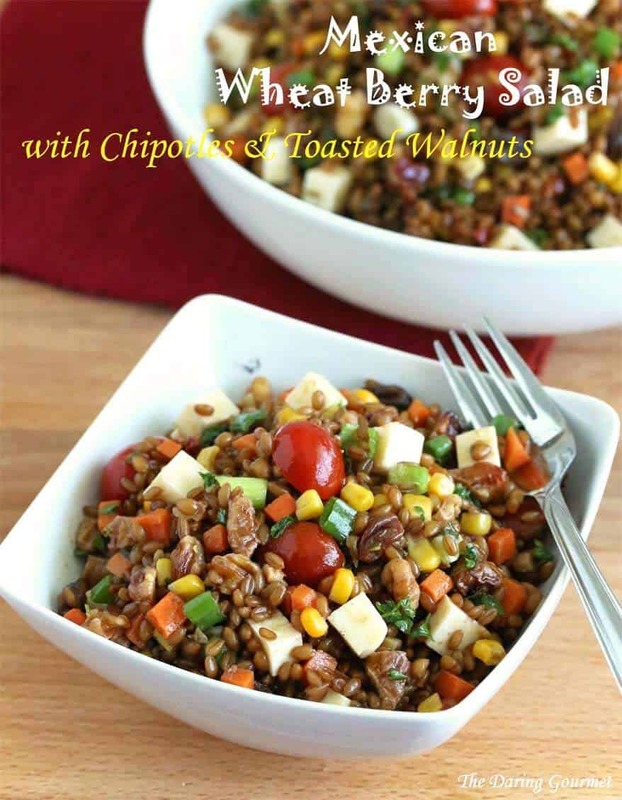 What a great way to use wheat berry! And I love the flavor combo – sounds amazing! What a delicious and highly nutritious dish you’ve prepared here. Such a gorgeous and healthy salad!!! Could you have made this anymore perfect! You did an amazing job! This looks so flavorful! And so healthy, too! Thank you for sharing! I love how nutritious this looks – so colorful and full of flavor! Sounds like my kind of lunch!